Human intelligence is a phenomenon. One person's intellectual feat influences Intelligent Minds elsewhere without physical contact. Just like Electromagnetic Induction. No sooner had Michael Faraday established the new Law of Inductance than communicating with electricity was entering others consciousness. In what today appears to be a logical step forward to apply the new found principles of electricity to the benefit of Humankind, many minds were working on the concept of the Electro-Magnetic Telegraph. But . . . The history of the telegraph plays out like a political thriller. It is extremely difficult to ascertain who deserves credit for what. Many earlier attempts at Telegraphy in one form or another failed. The reasons for failure were as many as the attempts made. Most were impractical, could not attract funding, or were ignored by authorities as unnecessary. Now though, with the dissemination of the discovery of Inductance, here it seems was something real. Several forms of an Electro-magnetic telegraphic apparatus appeared around the world, around the same time. 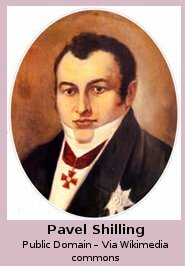 Baron Pavel Schilling, (1786-1837) a Russian Diplomat, built and then demonstrated a version of Telegraphy in the early 1830s. 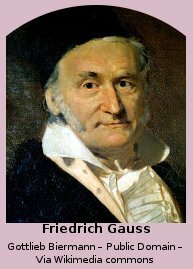 Fellow German Scientists Friedrich﻿ Gauss﻿ (1777-1855) and Wilhelm Weber (1804-1891) built a working line within the grounds of Gottingen University. Also in the early 1830s. American Physicist Joseph Henry, the man who independently discovered induction, without receiving the same recognition as did Michael Faraday, contributed his deeper knowledge of how to maintain a current over long distances by building an electro-magnetic device with which he transmitted electric current over a mile of wire to ring a bell at the far end. Henry accomplished this feat several years before Samuel Morse devised his first working model of the telegraph. His thoughtful solution was to endow the coil of his electro-magnet with many windings of fine wire as opposed to a few windings of thick wire. As was the method practiced by others. 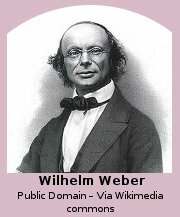 Henry also gave the world its first powerful Electro-magnet that produced work. Human intelligence is in it's element and at it's most effective when problem solving. A little recognized path to contentment. As much as new technology and innovation may benefit our species, it must be conceded that the overriding motivator for many marketers is the desire for wealth. The drawback of this attitude is many inferior products see the light of day. Suffocating their superior cousins that take much more effort to bring to fruition, but in the long run would represent better value for money. Kudos Goes To . . . The players who are the first to enter the conscious awareness of the consumer. Although occasionally, as was the case of the Electric Telegraph, the kudos fade, and attention is paid to a superior contender. Wheatstone, a physicist and inventor, knighted for his generous efforts towards physics, was the man who proved that electricity possessed Velocity and was not instantaneous. The velocity of electricity varies and depends on the conductor and its environment. Wheatstone's variant of telegraph worked on a system of five needles on separate circuits. The needles were on a dial with the letters of the alphabet so arranged that when the circuit was made via a make or break switch, two of the needles would be deflected to point at a letter of the alphabet. Although the complete alphabet was not represented, It was possible to decipher complete words. 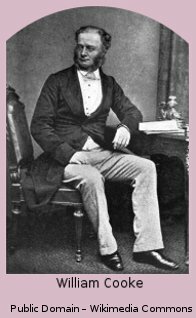 William Cooke, knighted like Wheatstone, was an army officer and had built his own version of a telegraph after a fortuitous exposure to a model of Pavel Schilling's device. Forming a partnership, Wheatstone and Cooke took out a joint patent on their respective offerings. Cooke, not withstanding his appreciation of the immensity of the influence their invention would have on the world, was, by his own admission, only in it for the money. Although he made a modest contribution technically to the undertaking, his real expertise lay in Business Administration. This he took care of, which, conversely, was repugnant to Wheatstone. 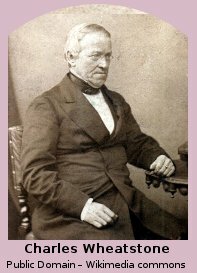 A naturally shy fellow, quite likely an introvert, Wheatstone immersed himself in the technical side of the business, employing his Human intelligence improving his device and developing other inventions. Useful inventions such as the Wheatstone Bridge, a device which during my Telephony years, we found indispensable when tracking down open circuits in underground telephone line cables. In the meanwhile, thousands of miles away, Charles Wheatstone's greatest competitor to be, Samuel Morse, was likewise immersed in thinking original thoughts.